During May the cadets of the Australian Air League Squadrons at Bundaberg and Hervey Bay had a special treat with a visit by the RAAF’s formation aerobatics team, the Roulettes. While they weren’t able to put on displays due to problems with their aircraft, the cadets enjoyed talking with the the pilots and gaining valuable knowledge on what is required to become a pilot in the RAAF. The Roulettes visited Maryborough on 28th May and invited the cadets to try out their flight simulator. 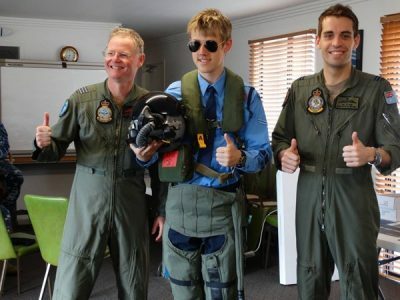 The cadets had a great time trying on the flight gear and flying the F/A-18A Hornet in the simulator, getting the chance to “fly” over Hervey Bay and Fraser Island, as well as performing aerobatics like loops and rolls. In was a great opportunity for the cadets to feel like they were flying a real jet and they all enjoyed experience. The cadets also had the opportunity to talk with pilots and other RAAF staff and gained valuable knowledge on what is required to become a pilot in the RAAF. The day ended with the cadets receiving information on the defence forces and some free gifts of caps, rulers books and stickers. WIN News was also on hand and interviewed the cadets and officers, featuring on the local news on Monday 30th May. After the visit Sqn.Lt. Di Ballard summed up the day, “The RAAF Roulette visit was a great eye opener for the cadets and officers that attended. All of the questions were answered thoroughly, thoughtfully and on a level that each cadet could understand, which was outstanding as we have a broad age span of cadets from 9 years to almost 16 years. The knowledge base was impressive and no question went unanswered. A big thank you to the RAAF Roulettes arranging a fantastic day!